This is the last of the home tour. I'll probably show before/after pictures as we do some updating on the house. Right now we don't have any work planned, but we know what our projects are for the future. As you can see, I only did one and a half walls with the dots. I didn't want the whole room to be so busy. This is the laundry room. It's directly across from Chloe's room. I'll eventually paint and put some organizational shelving and such in here. 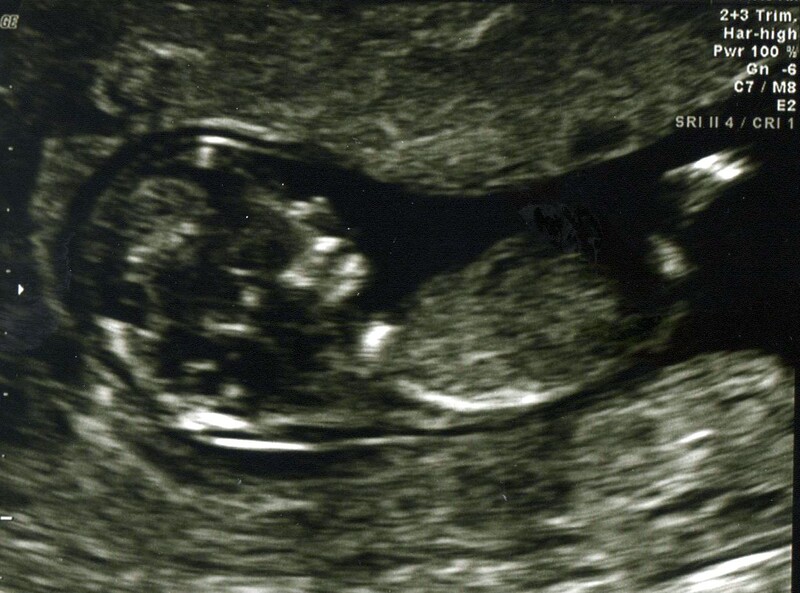 We are having baby G2 in June of 2013. We are about 14 weeks right now...starting the second trimester. Chloe turns 3 in May and this baby will make his/her appearance shortly after her celebration. We are so excited! Chloe is very adamant that she wants a brother. Mark is sure it's another girl. I have no idea nor do I care. I really don't. I would love to have son and think I would be sad to never have a boy. But, Chloe's so much fun that another girl would be a wonderful addition...plus I have a lot of girl clothes. We'll know more in January! This is probably my favorite part of our home. After living in a box for the last five years (don't get me wrong...our first home was great), this open floor plan is just what we needed. I love that I can be in the kitchen and still be a part of the family room activities. This part of our house is hidden in the back after you walk through the formal area. In our other house, you walked in the front door and were immediately standing in our family room. It can be a little awkward when you don't really know the person ringing the doorbell. The only two drawbacks to an open kitchen? 1. The dishwasher is loud. If you want to talk, you have to wait until bedtime to run it. 2. The kitchen must be kept clean at all times...everybody can see the mess when your kitchen isn't hidden behind a wall. I'm not complaining about either drawback. It doesn't bother me at all. I'm just pointing out the cons. Below is the kitchen. When we moved in the entire house was white. I don't mean a shade of white. I mean the base color white that they use to mix another color...as white as white can get. Blinding white. So we toned everything down by painting the walls a sandy beige and the kitchen 'Chocolate Milk.' We also had the counter tops replaced. They were white Formica...we had that in the other house and so we decided we wanted to upgrade to quartz. The view from the family room. View from the hallway entrance. 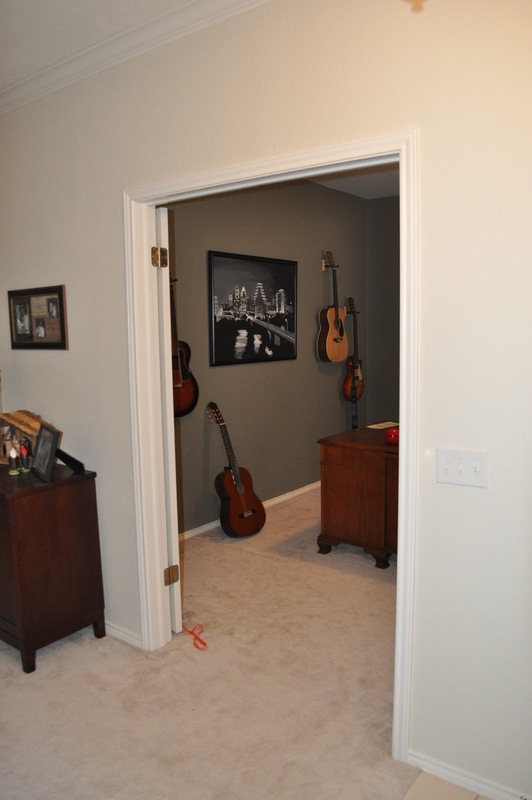 The door you see in the picture leads to the master suite. Just another angle of the hallway entrance. I know there are a ridiculous amount of pictures of the kitchen...it's my favorite part of this house. View of the family room fireplace. This is the breakfast nook. It's huge for a 'nook' so now you see why we really have no use for the formal dining area. Don't mind the ugly linoleum. I'll put tile in someday, but I've discovered that linoleum is really easy to clean which comes in very handy with a messy toddler and mealtime. 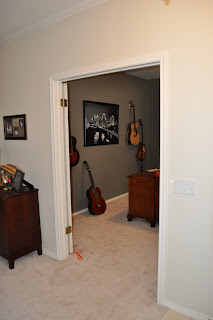 View of the hallway that leads to the spare bedrooms and laundry room...which is next up on the home tour. This is long overdue. But, I'm happy to start the tour of our new home. Below is our formal living/dining combo room. You can see the tree set up in the front window. When you turn to your right as you come in the front door, there is a double door to our office (pictures included in post). These are the double doors to the right of the front door that lead to our office area/man cave. Office. Mark picked the desk off Craigslist. I painted the room Antique Pewter. I just love the color! Please excuse the lack of curtains. When we moved in there were no mini blinds, so we spend quite a bit putting those up for privacy. Someday I'll get around to putting up curtains and window toppers to add warmth and personality. I honestly don't have a sense of urgency about it. We plan to be in the house for a very long time. That's all for now. I'll show our living room, kitchen and breakfast nooks next. I just need to do a little de-cluttering and that's difficult while Chloe is awake.